As the cremation rate continues to rise (currently over 60% in California), families are left with the decision of what to do with the cremains (ashes). Increasing families are turning to the scattering of ashes on the sea. Some families see it as a way to save costs or to have more flexibility when deciding and scheduling services. Many other families see it as a beautiful celebration of life and as a natural way to return to the sea, the place from which all life began. Anyone who had attended a sea scattering can attest to the beauty and serenity a scattering at sea evokes. 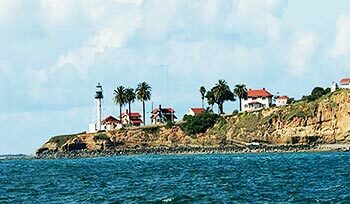 The San Diego area is the ideal place for performing scattering of ashes at sea because of the ideal environment and natural beauty of our surrounding. The atmosphere created by family and friends bonding on a yacht is unique and a setting of a yacht is difficult to create in any other venue. People have used cremation as a way to provide a final resting place as far back as 1000 BC in Europe. The Greeks used it as a way to return the remains of soldiers who had died in wars. After that, cremation was widely used with many families storing the ashes in beautiful urns. In the United States, cremation became increasingly more, and more popular beginning in the 1800s. The percentage of cremations has increased steadily since that time with some areas preferring the method due to lack of space, cost, and other aspects. One of the most, perhaps the most, preferable way of disposing of the ashes after the cremation is scattering the ashes on the sea. It is becoming the thing to do with cremains and as more and more people have experience with scattering at sea – the word is spreading. The serenity and beauty is hard to beat. Different religions may perform their ceremonies in very differing ways. For example, when scattering from our yachts Buddhists chant over the cremains on the trip out to sea. 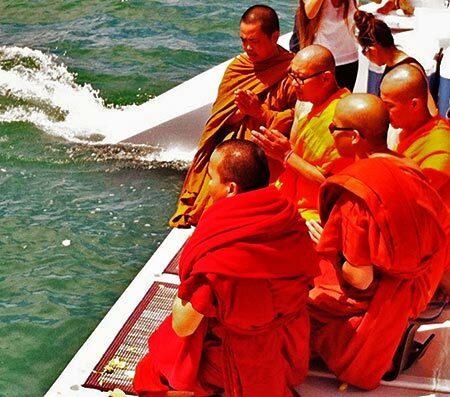 In Thailand, the ashes are actually floated out to sea in a wreath with candles. In Hinduism, the ashes are placed in the Ganges River if possible. In our experience on the yacht, Hindus’ often spread ashes on themselves and then wash it off in the ocean. When I am gone, release me – let me go. I will greet you with a smile and “Welcome Home”. We will be able to assist you with all your funeral needs either though our burial at sea company or through our California Licensed (FD: 2188) funeral home – Funerals Your Way. We provide complete services to our families.